Suffering in Phnom Pehn – Where's Walton? Following the night in a luxury hotel I was off back to what I was used to… spending the night with strangers in dorm rooms. But Max who I’d met in Ho Chi Minh was in town! He recommended the Envoy Hostel, it was out of town but in a really nice area with breakfast included. I liked it so much I stayed an extra night. 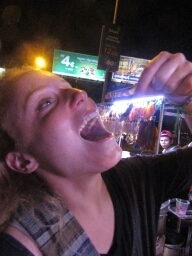 So the first evening we went to town to get some dinner with a few friends, see the local night market and sample some cooked creepy crawlies! 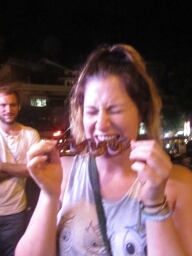 The last interesting thing I’d eaten was pig willy on a stick in China so I wanted to try something new… anything is better than eating an onion right?! We met up again with the Aussie girls (who I met in Hoi An for my birthday), Harrison (travel buddy from Koh Rong to Phnom Pehn) and Dani (friend of Ellie’s conveniently here on business). 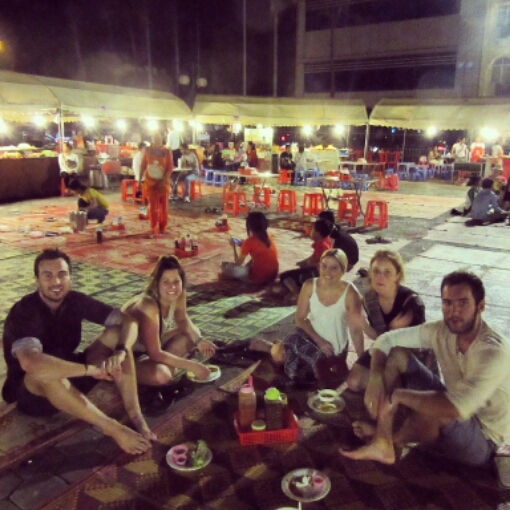 We ate dinner under the stars on some mats in the middle of the market. I sampled a wasp and some snake. Not tasty at all. I think it’s fair to say that if the locals aren’t eating it, it’s not good. It’s just there for us silly tourists. That night I said final farewells to the girls who are off home to Australia… unlucky for them I’ll be in Sydney at the end of January so they STILL can’t escape me. So what goes up must come down…the next day I woke up feeling sick. After being lucky enough to not get any illnesses so far in 2 and a half months here it was suddenly struck me on my last day in Phnom Pehn… being the typical me I was convinced I had Malaria or Dengue Fever and that travelling was over and I’d be spending Christmas in a hospital on a drip… but I tried to troop on that day as it was my last day with Max and Harrison and we had planned to see as many of the markets in town as possible in a day. But as we went from market to market I could feel myself deteriorating… after four markets I called it a day to go back to bed to sleep/feel sorry for myself. Annoyingly I had a flight to catch to Kuala Lumpur at 8am that I’d regrettably booked the day before so I was trying to refuel through sleep. But boy did my head feel like it was on fire! Luckily for me Max is a nurse and was there to bring me paracetamol, water and a cold flannel. I just slept through. At 5am I was off, and in my disgusting state I even got a phone number on my flight…(score! go me!) just an older Indonesian married man called Eddie who said to give him a call if I get any trouble when visiting his country next month. I’ll be needing that! He also gave me lots of advice on places to go when I visit next month. So I’m fine now (famous last words), I think my body was just telling me to take it easy for a few days and maybe to get a few vitamins (and to never eat wasp and snake again). So taking it easy is my plan in the next stop… Kuala Lumpur!